Back in 2009, the Region of Waterloo approved its new Official Plan, a document that guides the growth and development of a municipality. Guided by the province’s Places to Grow Act, Waterloo’s plan included guidelines that directed new construction inside of already-built up areas in order to preserve farmland and reduce urban sprawl at low densities. It also included a “Countryside Line” that would serve as a de facto boundary between urban and rural areas, protecting farmland and environmentally sensitive areas such as wetlands. Nevertheless, the plan estimated that only 85 hectares of “greenfield” development were needed over the next decade or so, quite a feat considering that the Region of Waterloo grows by 10 000 people every year. However, developers took issue with the calculations in the plan and appealed its approval to the Ontario Municipal Board (OMB), arguing that 1056 hectares of “greenfield” were required for development, more than 10 times the area approved by Waterloo’s council. The OMB sided with the developers. There is good news, though. 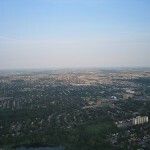 Recently, the province of Ontario joined groups such as the Ontario Greenbelt Alliance, Environmental Defence, and Waterloo Region Food Systems Roundtable in appealing the OMB’s decision. At stake are not just competing ideas of how our cities should grow, but precious agricultural lands that cannot be recovered once lost to bungalows or condominiums. And considering that Waterloo is just one community among dozens in the Greater Golden Horseshoe, the OMB’s decision sets a precedent for other municipalities’ growth plans, threatening still more agricultural land in the Greenbelt as our province grows in population. Sustain Ontario is committed to changing Ontario’s food system for long-term resilience, urging farmers, urbanites, policy makers and everyone in between to support local, sustainable, equitable and healthy farming and food policies. The OMB’s decision would pose a threat to the province’s progress over the past few years with the institutional protection of the Greenbelt and the recent reintroduction of the Local Food Act. As food prices continue to rise, access to nutritious food becomes increasingly difficult for our most vulnerable citizens, and more and more farmers are forced off their land and livelihoods, it is imperative that we build alliances across a multiplicity of sectors that support sustainable growth of both food and cities. If you would like to get involved in supporting the Region of Waterloo appeal of the OMB decision, visit their website to learn more and contribute your voice.